"When we first saw the New Horizons images, we thought instantly that these were dunes but it was really surprising because we know there is not much of an atmosphere," said Jani Radebaugh, Associate Professor in the Department of Geological Sciences at Brigham Young University. "However despite being 30 times further away from the sun as the Earth, it turns out Pluto still has Earth-like characteristics. We have been focusing on what's close to us, but there's a wealth of information in the distant reaches of the solar system too." Scientists have discovered dunes on Pluto, and say they are likely to have been formed of methane ice grains released into its rarefied atmosphere. Writing in Science, an international team of geographers, physicists and planetary scientists have analysed detailed images of the dwarf planet's surface, captured in July 2015 by NASA's New Horizons spacecraft. Those images showed that on the boundary of the Sputnik Planitia ice plain, and pushed up against a major mountain range, there is a series of dunes spread across an area less than 75km across. Following spatial analysis of the dunes and nearby wind streaks on the planet's surface, as well as spectral and numerical modelling, scientists believe that sublimation (which converts solid nitrogen directly into a gas) results in sand-sized grains of methane being released into the environment. These are then transported by Pluto's moderate winds (which can reach between 30 and 40 kmh), with the border of the ice plain and mountain range providing the perfect location for such regular surface formations to appear. The scientists also believe the undisturbed morphology of the dunes and their relationship with the underlying glacial ice suggests the features are likely to have been formed within the last 500,000 years, and possibly much more recently. The research was led by scientists from the University of Plymouth (UK), University of Cologne (Germany) and Brigham Young University (USA). Dr Matt Telfer, Lecturer in Physical Geography at the University of Plymouth is the paper's lead author. 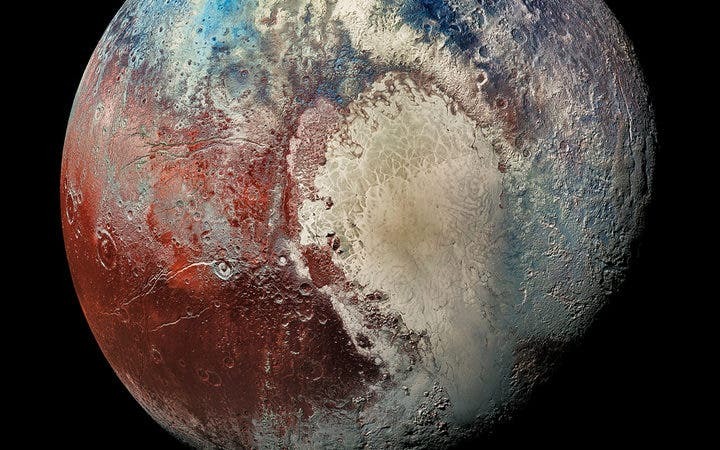 He said: "We knew that every solar system body with an atmosphere and a solid rocky surface has dunes on it, but we didn't know what we'd find on Pluto. It turns out that even though there is so little atmosphere, and the surface temperature is around -230?C, we still get dunes forming. The New Horizons data has given us a new level of detail, but we had to work hard to explain how it was possible to get the supply of sediment, a non-cohesive surface and wind you need for dunes. It is another piece of the jigsaw in making sense of this diverse and remote body, and gives us a more fundamental understanding of the geological processes which are influencing it." Dr Eric Parteli, Lecturer in Computational Geosciences at the University of Cologne, said: "On Earth, you need a certain strength of wind to release sand particles into the air, but winds that are 20% weaker are then sufficient to maintain transport. The considerably lower gravity of Pluto, and the extremely low atmospheric pressure, means the winds needed to maintain sediment transport can be a hundred times lower. The temperature gradients in the granular ice layer, caused by solar radiation, also play an important role in the onset of the saltation process. Put together, we have found that these combined processes can form dunes under normal, everyday wind conditions on Pluto." The researchers now plan to continue their investigations into the history of Pluto's dunes through computer simulations, which will enable them to expand knowledge of the role wind has played in Pluto's wider geology. Homo Naledi, Newly Discovered Species –"Maybe We've Had the Story of Human Evolution Wrong the Whole Time"